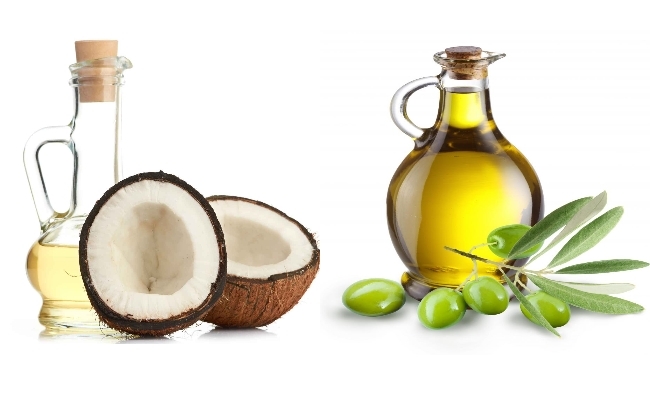 Werner's Cairns blog: Coconut or olive oil that is the question? Coconut oil versus Olive oil. We know fat is back. Butter, ghee, avocado oil, duck fat -all of ’em are fair game, now that saturated fat is no longer the cardiac villain we thought it was. And sure, while most amateur chefs might be unsure about deep-frying parsnip fries in lard; even kitchen novices are comfortable cooking with olive oil and coconut oil these days. Widely considered the healthiest oils available, they two have become pantry staples. But there are some pretty big differences between them when it comes to nutrition facts and general use—olive oil and coconut oil are not interchangeable. Both serve different purposes, and depending on what you’re up to, there’s usually an obvious choice. Here’s a full breakdown to drizzling, spreading, frying, and DIY-ing with each. We’re big fans of coconut oil. Between the health and beauty benefits, it’s versatile enough that it deserves a spot in your pantry and medicine cabinet. Even the highest-quality coconut oil is affordable, and it works incredibly well for both cooking and baking—as long as you use it correctly. Here’s what you need to know. As with olive oil, there are different classifications of coconut oil that tell buyers how it’s made and how much processing was involved. Refined: Usually flavourless and odourless, refined coconut oil is produced by putting coconut meat through a chemical distilling process to extract oils. Often these products are bleached and deodorized to make them “prettier” and more attractive to consumers. Unrefined (virgin): Generally, virgin or extra-virgin coconut oil is made from the first press and extraction of coconut meat without the addition of chemicals. However, sometimes virgin coconut oil is exposed to heat, which makes the flavour more pronounced. Cold-pressed: This type of extraction method can be used for raw, unrefined coconut oil. Coconut meat is pressed and heated to no higher than 120 degrees Fahrenheit in order to retain certain enzymes and health benefits. Expeller-pressed: One of the most common (and cheapest) extraction methods, in this process, dried coconut meat is exposed to high heat and pressure to yield the oil, which ends up being much lower quality and discoloured. Usually it then needs to be refined with chemicals to clean and deodorize it before it’s sold to consumers. Centrifuged: In what happens to be the most expensive extraction method—which is used only on unrefined coconut oil—coconut meat is dropped into a high-speed centrifuge that spins to separate the oil. Usually, in shopping for coconut oil, organic, virgin, and either cold-pressed or centrifuged products are best. They retain the most nutrients because they’ve gone through minimal processing and haven’t been heated to super-high levels (we’ll get to why that’s important in a minute). We’re all going gaga over coconut oil because it’s packed to the brim with macronutrients and micronutrients. Yep, it’s more than 90 percent saturated fat, but recent research has proven there is no link between saturated fat intake and higher cholesterol. On the contrary, coconut oil has been proven to increase good HDL cholesterol levels and decrease bad LDL cholesterol—which actually means it good for the heart. The healthy fatty acids in coconut oil are primarily composed of medium-chain triglycerides, or MCTs. MCTs are really easy for the body to metabolize and use as quick energy. In fact, they move straight from the digestive tract to the liver, where they’re used almost immediately instead of getting stored as fat (like other types of fatty acids). So even though it’s high in calories, coconut oil isn’t likely to make you store belly fat like other high-fat foods. There are even some studies that suggest a higher intake of MCTs intake can increase metabolic rate by 7 percent a day. Coconut oil also boasts a ton of lauric acid, a type of fatty acid that is antibacterial, antifungal, and antiviral, and can even kill the nasty pathogens that cause yeast infections. As a result, downing a spoonful of coconut oil is often recommended by naturopaths to treat candida. Because it seems to boost metabolism, and because adding more fats to your diet can help keep you satisfied for longer, coconut oil seems to promote weight loss. In a study of 40 obese women, those who added one ounce of coconut into their daily diets—without making any other changes—saw a reduction in their BMI and lost inches off their waistlines. For the record, one tablespoon of coconut oil has 14 grams of fat and is equivalent to about 120 calories. Most people don’t know that all cooking fats aren’t interchangeable. You shouldn’t just heat up any oil and get to frying and sautéeing—when some fats are exposed to high heat (aka the temperature you need for perfectly crispy tempura), they go through a chemical change that leaves them basically toxic. All fats have a smoke point, but most of the cooking oils that are considered healthier have a lower heat threshold. Unrefined oils tend to be higher in minerals, enzymes, and beneficial compounds than refined oils because they haven’t been exposed to heat during production. But when they get too hot and start smoking, not only does the flavor turn kind of burnt and bitter, but the fatty acids begin to break down and release free radicals. That’s no good—that pool of flavorful, healthy oil has now turned into a smoking, carcinogenic mess that you certainly don’t want to end up on your food. If you’re feeling adventurous—and are willing to set off your smoke alarm—you can try this for yourself. Heat up a pan on the stove top. Add in a dollop of coconut oil, and slowly raise the heat. You’ll notice that at a certain temperature, the oil will begin to brown and smoke—you’ve just witnessed fatty acids transform into free radicals. Fortunately, despite its relatively low smoke point, meaning it’s pretty great for baking, sheet-pan roasting, and lightly sauteeing. Because it has a delicate, lightly sweet flavor, it works well in smoothies, too. What coconut oil is best for. Coconut oil and butter are analogous—they have the same smoke point, and in recipes, you can sub either in for the other at a 1:1 ratio. Because coconut oil has a unique texture and solidifies quickly when exposed to cooler temps, it shows up in lots of dessert recipes that require a hard candy-coating or a softer, fudge-like texture at room temperature. Some might taste sweeter and more coconutty (depending on how they’re made), but milder versions can even be used in savory dishes just as you would use other cooking fats with similar smoke points like butter, sesame oil, and vegetable shortening. Coconut oil has gained popularity partially because it’s so versatile—no need to worry about running out of uses for a 15-ounce jar! Because coconut oil is high in lauric acid (an antibacterial compound), as well as vitamin E and vitamin K (two beauty-boosting vitamins that have anti-inflammatory and anti-aging effects), it’s great for skin and hair. For the super low-maintenance, a dab warmed between the palms becomes an ultra-hydrating moisturizer for the body and face. For an extra-soothing body oil, combine it with lavender, vanilla, or orange essential oils (even though it already smells heavenly!). Rub it into hair for deep-conditioning treatment, massage into lips for all-natural chapstick, or combine with raw sugar for a gentle face scrub. Want some more inspiration? Check out this video for five more ways to use coconut oil in your beauty routine. The Mediterranean diet gained popularity in the ’90s, but what some initially pegged as a “fad” has proven to be a lasting and effective way to manage weight and improve heart health. It takes its name from the eating habits of people living around the Mediterranean Sea; residents of the region have a very high quality of life with little disease and longer lifespans compared to the rest of the world. The MVP of the Mediterranean diet is none other than olive oil. That, along with subsequent studies proving its many health benefits over the years, it’s safe to say olive oil can be found in most kitchens in the United States. In 2007, Americans consumed more than 70 million gallons, almost ten times as much as they did in 1982. But most people don’t realize that as soon as olive oil gets exposed to high heat, it basically loses all of its health cred. Here’s what you need to know about cooking with it. There are typically three different types of olive oil you can find at grocery store shelves: extra virgin, virgin, and regular. The extra virgin moniker denotes an unrefined oil that’s produced from the first pressing of olives. It’s typically considered the highest-quality and best tasting because it has highest number of active phenolic antioxidants, which not only fight free radical damage, but have also been shown to reduce pain and inflammation as effectively as ibuprofen. Just like coconut oil, when olive oil is exposed to high temperatures during processing, its micronutrients are destroyed. When buying, try to find a bottle of extra-virgin olive oil from a reputable seller—because it’s such a hot commodity, olive oil fraud has become a legitimate problem. Scammers will blend together lower quality vegetable oil with refined olive oil and slap an extra virgin label on it in order to sell it for a higher price. Always double check the source of the oil you’re buying, and you’ll know you have good quality oil if it lacks bitterness and has a robust olive taste. Seventy-three percent of olive oil is made up of monounsaturated fats, a type of long-chain fatty acid that’s considered one of the healthiest, according to the American Heart Association. Monounsaturated fats have a positive effect on heart health, and olive oil has the highest percentage of any edible oil. Because it’s so high in the antioxidants and healthy fats, olive oil has impressive cardio protective benefits. Lowers cholesterol: Monounsaturated fats can reduce bad cholesterol levels in blood, lowering the risk of heart disease and stroke. Reduces blood pressure: In a study of 23 hypertensive patients, those who increased regular use of olive oil in their diets for six months had markedly lower resting blood pressure numbers. Helps prevent blood clots: Some studies have shown that olive oil decreases blood clotting, which can prevent heart attack and stroke. Decreases inflammation: Oleic acid, one of the most prominent fatty acids found in olive oil, has been proven to reduce inflammation while oleocanthal, an antioxidant, works the same way as ibuprofen to reduce inflammation. Coconut and olive oil have a very similar macronutrient breakdown—one tablespoon of olive oil has 14 grams of fat and 120 calories. What olive oil is best for. Because its smoke point is lower, olive oil is best for oven-cooking, salad dressings, light sautéing, and drizzling. Due to the slight olive flavour, it works especially well on savoury foods like proteins and veggies. Coconut or olive oil? Coconut oil isn’t the only multi-tasker you can find in the kitchen. Olive oil works as an impressive moisturizer for everything from cuticles to fly aways. Here’s the thing - both of these oils are worth having on hand at all times. For slightly higher heat cooking, DIY beauty routines, and baking and sweets, coconut oil easily wins. But to improve heart health and for bread-dipping, extra-virgin olive oil takes the cake. If anything, don’t be afraid to add some healthy fats to your diet. They have so many health benefits—and they make everything taste better! Source. 1. Coconut oil, 10 life improving uses. A very elucidating posting, Werner, thank you. We have to be very careful these days what we consume and importantly; read the labels before buying anything to see what’s in it and where is comes from. Excellent posting, Werner, you have convinced me to go for coconut oil. thank you. This information is very interesting Werner. Thank you for sending it to us.